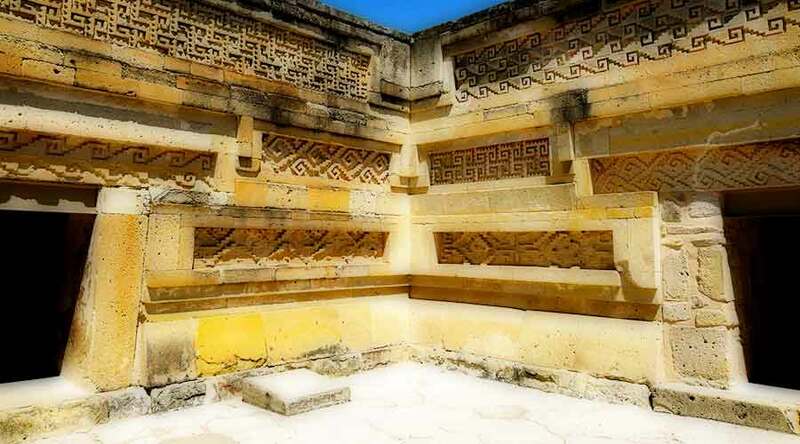 The Mitla archaeological site is located in the state of Oaxaca, a town where evidence of an important Zapotec population has been discovered, under another important Mixtec population. However, the name comes from the Nahuatl word Mictlán, which comes to mean “cemetery” or “site of the dead”. At present, the town of San Pablo Villa de Mitla, head of the municipality, is located there. Mitla has been a human settlement since pre-Christian times. The Zapotecs occupied the region and established the urban center of a hierarchical society, which maintained contact with other Mesoamerican cultures over the years. It was, however, a fortified city. The Zapotecs built palaces and monuments, as well as decorations and artifacts. The Zapotec name was Lyobaan, place of rest. Subsequently, the Mixtecs were established on the site, who also left their own buildings and cultural displays. The Mixtecs gave it the name of Ñuu Ndiyi, place of the dead. The nobles, high priests and kings were buried there and then went on to become “People of the Clouds”, as it was believed. The Spaniards arrived in Mitla in the 1520s, and left first hand descriptions of what they found in architectural and cultural terms. However, given the great geostrategic value that they attributed to the enclave, they destroyed many buildings to build their own. For example, the Cathedral of San Pablo was constructed for the most part with materials extracted from the destruction of temples and monuments found in Mitla. Given the privileges that the Church maintained since the time of the conquest, and given the limited knowledge of the cultural value of the prehispanic settlements, this destructive process came to a halt only in the mid-nineteenth century, when Benito Juárez enacted the Reform Laws, which nationalized the ecclesiastical property. The American archaeologist Adolph Bandelier was the first to conduct an exploration of the area in 1881, followed by Marshall Saville, who made the first excavations. The first intervention work for conservation purposes, in 1901, corresponds to the Mexican archaeologist Leopoldo Batres. The Mitla archaeological site is in the center-north of the town of San Pablo. It is a small enclave, a small percentage of the city from which it comes. The area is currently divided into five groups for study. The Group of the Church is the one that is more to the north of the archaeological zone, is also called North Group. It consists of three patios aligned, the courtyard of the south end is the site on which the Church of San Pablo was erected, hence the name. The Group of Columns is located directly south of the Church Group. Its courtyards are characterized by the presence of six wide-based columns in their rooms. The so-called Tomb 2 is located there. The Arroyo Group is located east of the Group of Columns, on the banks of a tributary stream of the Mitla River. It is quite deteriorated, but retains walls and drawings in them. These first three groups were built by the nobility of the site and have been excavated in their entirety. The Calvary Group, or Adobe, is located a little northwest of the Arroyo Group. The Group of the South, is something further away of the others, to the south of the set, near the River Mitla. These two are the oldest groups. Mitla represents the second archaeological enclave of Oaxaca, with a fundamental historical value for the understanding of the prehispanic cultures that populated Mexico. Currently it is very well preserved and the site allows the visit of anyone interested in the subject. About 27 miles (46 km) southeast of Oaxaca, you’ll find the ruins of Mitla, just outside the town of San Pablo Villa de Mitla. Taxi: A taxi from downtown Oaxaca City will cost about $200 pesos or more. But you can use a collectivo taxi, shared taxi, from Estadio Eduardo Vasconcelos (map). Here you will find a main bus stop with buses and collectivo taxis going from Oaxaca to El Tule and Mitla. Collectivo taxi to Mitla is $25 pesos per person. Bus: You can find buses at the Estadio Eduardo Vasconcelos (map).